It’s 4:01 a.m. and my alarm is going off. Welcome to the beginning of my first Mother’s Day. 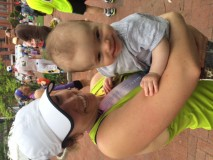 My first Mother’s Day was filled with all the things I like: getting up before the sun is up, running, sweating, earning race bling, and a little hot yoga (because running a half in high humidity just wasn’t enough sweat for one day). 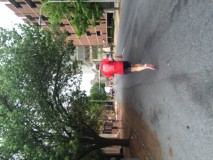 The Delaware Running Festival has become a mainstay in my running career – 6 years in a row and going strong. Each year the hills seem just a tad bit easier and the race medals seem just a tad bit bigger. This was my first half since the birth of my son 5 months ago. While not a PR by any stretch of the imagination – I was still very happy with my finishing time of 2 hours and 9 minutes. Both the full and half marathon started at 7 a.m.; the 4 and 8 person relay started at 7:15 a.m. As my previous post on the race explained, there are a lot of running options for all levels of runners. Per usual Delaware weather, it was very humid. Thank goodness for the thick cloud cover which managed to keep the temperature in the mid 70’s. 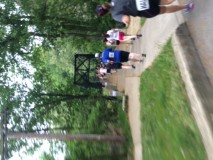 I love the course for the Delaware half! To me, this course embodies all the wonderful amenities that Wilmington has to offer! 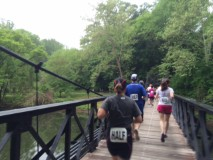 You start with a loop around the Shipyard shops and along the Christina River, up through the business district, along a path by the Brandywine zoo, over the swinging bridge (which is so fun to run over! ), along Brancroft Parkway (and some the most beautiful homes EVER), through Little Italy, with a strong finish down King Street. And by strong finish, I mean about .5 miles of torturous uphill – with a fun last leg downhill to finish at Tubman Garrett Riverfront Park. I tried to take some pics so you all can get a “feel” of the course. Tubman Garrett Riverfront Park was packed with spectators, families, and friends all ready to celebrate the finishers as they come across the finish line. This year was special for me because I knew my “pit crew” of Jimmy & Baby G was waiting for me. My running partner Teen also had her cutie pie family there too. Have I bragged on Teen recently? Well – just let me tell you – she has gone complete beast mode in running. She finished in 1 hour 51 mins. Shout out to all the fast moms out there! If you are looking for a fun activity to do next Mother’s Day – I hope you consider signing up for this race. 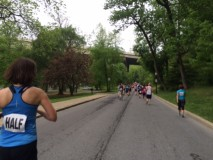 Were you able to get a run in on Mother’s Day? Or do you have another Mother’s Day fitness tradition? Let us know all about it!